Jeevan Kumar decided to send his wife flowers one day, but when he got home he found her upset. Although the flowers were beautiful, the delivery guy was less than prepossessing and she was afraid to even open the door. 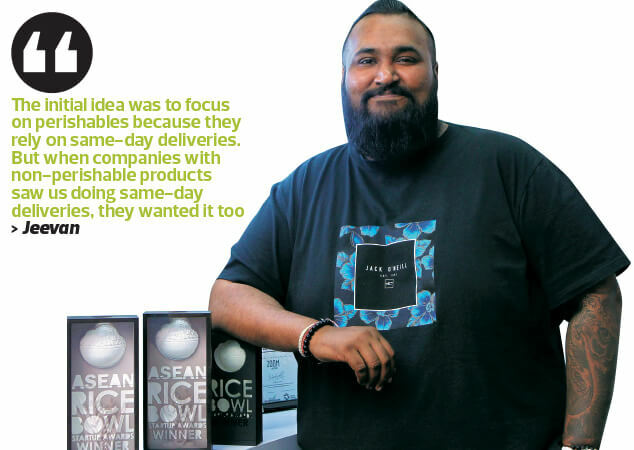 He shared this experience with his buddies Sean Lee and Mohd Hafiz at one of their regular catch-up sessions and realised that his wife’s bad experience actually signalled a gap in the market — traditional logistics companies did not deliver perishables such as flowers, food and drinks. The three of them decided to visit the flower delivery company in question, BloomThis, which shares this problem, as they saw it, with other same-day delivery services. Of the three, only Hafiz was tangentially involved in the logistics business, selling computer and video games and working with freelance drivers to deliver these games to buyers across the Klang Valley. They decided to test out a last-mile logistics solution and picked the 10 most presentable delivery guys to deliver flowers for BloomThis. The company agreed and they spent the last two weeks of December 2015 training the delivery guys to make sure they were well-groomed and courteous enough to meet customers. “BloomThis was our first client and they tried us out for a month. We did well, so they let us carry on servicing them. We then used BloomThis as a case study to approach other floral companies. In fact, our first three major clients were florists,” says Jeevan. The trio have carved out a niche in the business-to-business (B2B) space. “We service both e-commerce and bricks-and-mortar businesses that sell products to consumers. We do not deal with end-customers, except at the point of delivery,” says Jeevan. Lee, who has a background in sales and customer acquisition, was put in charge of visiting and cold-calling potential clients. As Zoom’s client list grew, the company acquired a reputation of sorts and started receiving calls from smaller companies that had noticed Zoom riders on the roads in the Klang Valley. The company grew pretty quickly. In fact, eight months into the business, Zoom had a rider force of 50 to accommodate the demand for same-day deliveries. In the early stages, its clientele comprised small and medium enterprises, most of which were food and beverage vendors and florists. This was because the company not only offered same-day deliveries but it did so a lot more cost-effectively than its competitors, especially for smaller orders. “If you want to open an account with larger logistics companies, the down payment is, on average, five times the RM1,500 that we charge,” says Jeevan. Although they set up the company to deliver perishable goods, their services caught on and companies with non-perishable goods started to get on board in 2017, roughly a year into their operations. “The initial idea was to focus on perishables because they rely on same-day deliveries. But when companies with non-perishable products saw us doing same-day deliveries, they wanted it too,” says Jeevan. There was such a pent-up demand for its services that Zoom grew at an exponential rate. It moved into the Indonesian market last year, its second year of operations. During this time, it also branched out into the non-perishable-goods market and started servicing larger e-commerce platforms such as Zalora, Lazada and Herbalife in Malaysia. In Indonesia, it services online malls such as Blibli, Tokopedia and Bukalapak. Now, Zoom has a team of 440 full-time drivers as well as a freelance workforce of about 5,000. Its freelance drivers operate like Grab drivers, where they can sign up with the platform to do deliveries as and when they are able to. The company currently makes 100,000 deliveries a month on average in Malaysia and Indonesia. Once the company established itself in Malaysia and was confident of raising funds, it decided to expand into Indonesia. Instead of starting from scratch, it found an existing Indonesian last-mile logistics company and worked out a joint venture, offering Zoom’s brand and technology in return for a majority stake. After a year, the two companies have fully integrated their business and operations. Today, the business is fully owned by Zoom and is known as Zoom Indonesia. The company handles the last-mile logistics of some Indonesian e-commerce companies and it has its own network of drivers and customers. “These became our customers when we took a majority share,” says Jeevan, adding that its Indonesian operations generated an annual revenue of US$1 million. Zoom had been in the Indonesian market for exactly a year last October. While it plans to continue expanding the business there, the partners intend to test out new features in Malaysia first. “It is easier to carry out testing in a smaller, more controlled environment,” says Jeevan. Like other companies, one of the major challenges Zoom faces is talent acquisition. It has 60 employees, ranging from warehouse staff to those who deal with customer care. None of them had any experience in the logistics industry. Jeevan and his partners hired staff based on their passion and willingness to learn, but admitted that they would need to bring in skilled people with different perspectives for the company to continue moving forward. Where did the three founders find the money to start the business? Jeevan says they received a lot of support from their family and friends. And besides, they all had their savings, which they dug into, to put up the initial RM150,000 needed to set up the company. They did some projections and realised that they would need RM800,000 in their first year and about RM1.2 million in their second. By then, the company was making money and part of its profit was reinvested in the company and used to fund its expansion. It is currently undertaking its Series A round of funding, 15% of which will be used to grow its services in Malaysia. It plans to expand into Penang and Johor as well as strengthen its Klang Valley base. The rest of the funds will be used to expand its services in Indonesia over the next 14 months. Right now, Zoom has a presence in Jadodetabek, but it is looking to be in five more cities — Jakarta, Surabaya, Medan, Yogyakarta and Bandung — by the end of this year. “We currently have more than 300 riders in Indonesia and will scale up to 1,500 riders. For the freelance workforce, we have about 3,000 riders and we need to scale that up to at least 40,000 as people download the freelance driver app, resulting in 12,000 to 15,000 active drivers by the end of 2019,” says Jeevan. The company has about 5,000 freelance drivers in Malaysia and Indonesia, 30% of whom are active. These freelancers take a 70% to 80% cut of the customer’s payment, which varies according to the distance travelled and weight of the deliveries. The majority of them are Grab drivers doubling as delivery men. Zoom hopes to venture into Vietnam by 2020 as part of its regional plan. Jeevan says the country is a great market as it has one of the highest average revenues per user in terms of online spending. “This is a market that fits in with the services offered by Zoom. Their average basket size is more than US$200, compared with Malaysia, which about US$40. Vietnam has a lot of people and motorcycles and the unemployment rate is high among the male population. So, going into that market to cater for the local population will be great,” he adds. In the last 10 months, the company has generated revenue of between US$1.5 million and US$2 million. And, as Jeevan points out, Zoom is certainly going places.